U2 are special guests at BBC Radio including a special Live Lounge session on BBC Radio 1. The band will be performing three tracks for a Radio 1 Live Lounge session in Jo Whiley’s daytime show from 10.00am. Later today on BBC Radio 2, Chris Evans will play host to U2 on his drivetime show at 5.00pm, interviewing all four members of U2 about the secrets of their success, from their formation in Dublin in 1976, to nine number one albums in the UK and 22 Grammy Awards. A number of lucky Radio 1 listeners will be able to watch the band live at the BBC Radio Theatre. 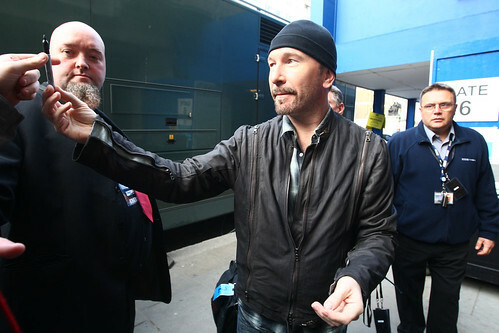 U2log.com hopes to be able to bring you a special report from inside the theatre. Update: The band played Get On Your Boots, Beautiful Day und Breathe on the Jo Whiley show. They also recorded Magnificent for another show. See also U2tour.de twitpics. I can’t listen to it live as I don’t have Real Audio on my work laptop. Grr. Aargh.